Usual Means of Access: Surrounded by thick jungle growth, the Swampland seemed to be accessible only by air. 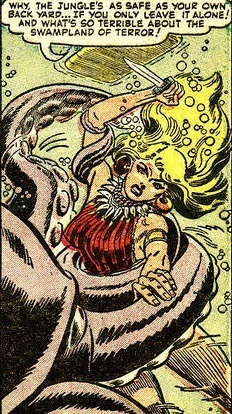 History: (Lorna, the Jungle Girl I#7/4 (fb) - BTS) - The origin of the isolated Swampland of Terror and its strange life-forms is shrouded in mystery (see comments). 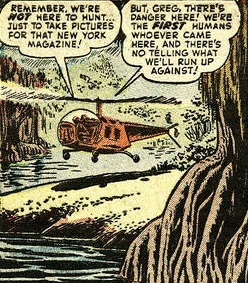 (Lorna, the Jungle Girl I#7/4) - Accompanied by Lorna and her monkey Mikki, Greg Knight flew by helicopter to the swamp on a photography assignment for a New York magazine. After they landed in a clearing, Greg made Lorna promise that she'd stay out of trouble and leave the creatures alone. 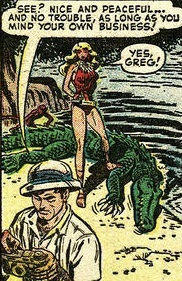 But as Greg was taking a picture, he didn't notice a crocodile approaching him from behind--Lorna killed the reptile while Greg was completely unaware of the danger in which he'd been. After inflating a rubber raft, the two paddled through the swamp's waters, and along the way Greg's attention was focused on his camera when a giant vulture swooped down at him--Lorna grabbed the attacking bird and snapped its neck. Further along, Greg was still engrossed with his photography and completely oblivious to a tentacle that reached up for him from the water--Lorna jumped off the raft and fought the attacking octopus below the surface. 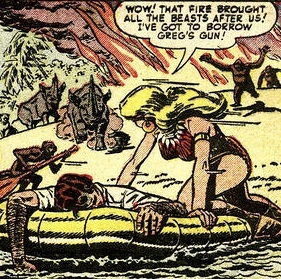 After killing the aquatic monster, Lorna surfaced to see that Greg and Mikki had paddled to the shore of a small island; swimming up to them, Lorna explained she had accidentally fallen out of the raft, and the unsuspecting Greg scolded her for being clumsy. As they walked on the island, Greg wanted to get a picture of the beautiful flowers, but Lorna realized that the vegetation was really man-eating plants. Remembering her promise to Greg, Lorna had Mikki climb up a tree and drop a coconut on Greg's head to knock him out, so he wouldn't be able to see what she was about to do; Lorna then lit a torch and set the monster plants afire. With the island's vegetation ablaze, Lorna hefted the unconscious Greg on her shoulder and carried him back to the raft. They left the island's shore just as more beasts charged from the burning jungle. While she paddled the raft back toward their helicopter, Lorna had to use Greg's gun to fight off more attacking water beasts--another crocodile and octopus, and (what appeared to be) a sawshark! Upon reaching the 'copter, Lorna had to kill yet another attacking giant vulture with her knife. After starting the helicopter and taking off, Lorna flew them away (see comments) just as Greg regained consciousness. Stretching the truth a bit, Lorna explained to Greg that he had been knocked out by a falling coconut just as the island caught fire (...leaving out many pertinent details in her story). 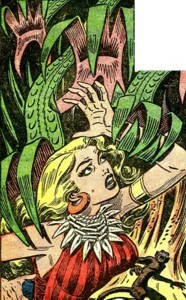 During their flight back, Greg told Lorna that it was nice to have had a quiet and peaceful visit to the Swampland of Terror--he was blissfully ignorant that the jungle girl had saved him from a variety of menaces. Comments: Created by Don Rico (writer) and Werner Roth (artist). It wasn't stated exactly where in Africa the Swampland was located, but considering the unusual plant and animal life-forms (which may have not been natural), my guess is that it was in the Congo; Marvel Atlas#2's entry for the Congo mentioned that Deviant scientists were known to have experimented in that area--maybe this swamp was where their laboratory was, and the various unusual plants and animals were created by them to deter intruders. 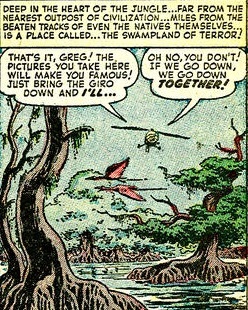 Maybe the Swampland of Terror was the same swamp that Lorna's fellow jungle girl Jann would later visit (see HERE). Considering some of the freakish animals that were present in this swamp, maybe this is where the Night Beast that Lorna would later confront had originated. Lorna's helicopter-piloting skills would also come in handy when she later flew the Devil Bird. One of (at least) two crocodiles that inhabited the Swampland of Terror, it crept up to Greg Knight while he was taking a picture, but the jungle girl Lorna jammed a branch in its mouth and stabbed it with her knife. Later, Lorna had to fight off yet another crocodile (along with a sawshark and an octopus) when it attacked as she was paddling a raft through the swamp's waters. While Lorna and Greg Knight were paddling their raft in the waters of the Swampland of Terror, the first of these birds swooped down and was about to attack Greg while he was taking a picture, but Lorna broke its neck. The second vulture later attacked when Lorna carried the unconscious Greg back to their helicopter; Lorna killed it by slashing it with her knife. One of (at least) two octopi that inhabited the waters of the Swampland of Terror, it reached its tentacle out and attempted to grab Greg Knight while he was taking a picture; Lorna fought it underwater and killed it with her knife. 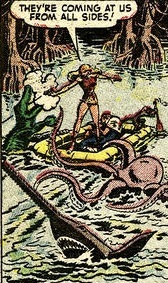 While paddling a raft back to their helicopter, Lorna had to fight off yet another octopus (along with a crocodile and a sawshark). Carnivorous plants which grew in the Swampland of Terror, Greg Knight was attempting to get a picture of them--he thought they were merely beautiful flowers. But realizing the true nature of the vegetation, Lorna lit a torch and set the man-eating plants ablaze.